Welcome to the worlds greatest guide to Women's Cotton Flannel Loungewear. 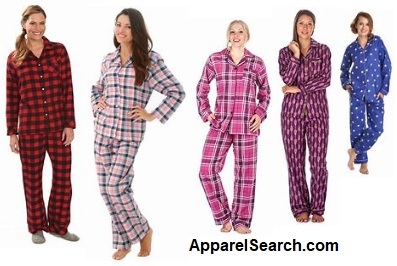 Are you actually looking for information about ladies cotton flannel loungewear? Well, we hope you are because the reality is that you have found our page on the subject. In this women's clothing section of the Apparel Search directory, you will find all sorts of interesting information regarding women's cotton flannel loungewear. The first question, "What is loungewear?". After you visit that link to learn about the meaning of the word, we can move on to figuring out why it is often made with cotton fabrics. We can also review what is meant by flannel. So why is loungewear often made with cotton fiber fabrics? Cotton has many fabulous benefits. Rather than explain to you on this page, it would be a good idea for you to take a moment to read about the benefits of cotton from our previous blog post on the subject. Flannel is a kind of soft-woven fabric often made of cotton. The fabric is slightly milled and raised. Flannel was originally made from carded wool or worsted yarn, but is now often made from either wool, cotton, synthetic fiber or blends. Are you going somewhere today? Neither are we. That's why today is a perfect day for flannel cotton loungewear to keep things comfortable and relaxed. Fabulous day for hanging out at home. Look stylish and feel comfortable while lounging. It is always a flannel time of year somewhere in the world.